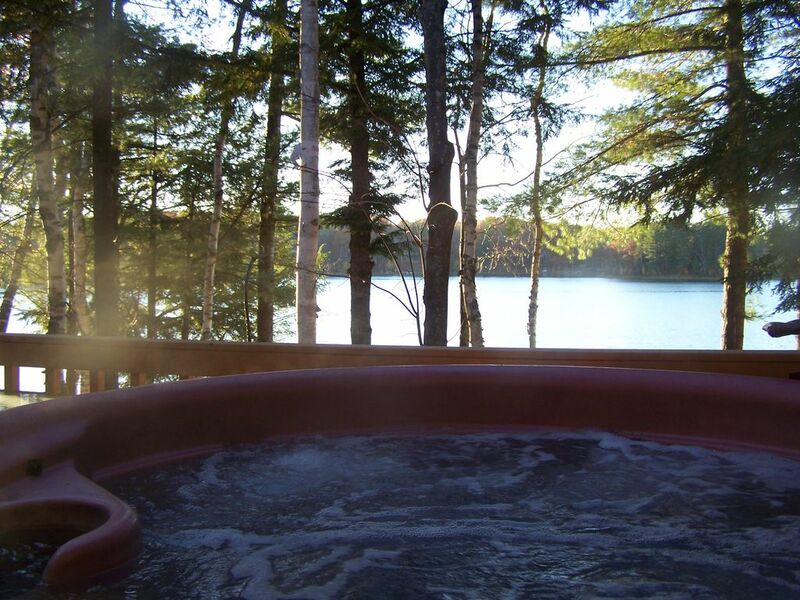 This Charming Lake Arrowhead chalet on Sunset Side of private all-sports lake, Lake Arrowhead will let you leave your worries behind as you enjoy Michigan in it's purest form on the lake with outdoor hot tub! Enjoy this 3 BD 1.5 BA Lakefront Chalet & bring along the whole family for some summertime fun in this classic Alpine Chalet. This vacation rental, located just 6 miles to downtown Gaylord has full access to the lake with a deck to enjoy the sunset from! Rent a boat, barbecue, swim, or do whatever floats your boat - sweet summertime is calling!! We are offering this home for summer seasons with pontoon rental which is $700 plus tax extra which includes 12 gallons fuel and pick up and delivery to and from your dock. If you are booking any June July and August full weeks now or in the future, there will be a pontoon with the home and VRBO will send over the payment request for the pontoon rental. If you do not want a pontoon, please do not instantly book this home. We are only accepting summertime full weeks with pontoon included only as in previous years. Pontoon is for leisure and fishing only, no tubing. Thanks!! f you do not want a pontoon, please ask as I do offer other homes without pontoon included. Master bedroom has King bed, 2nd bedroom has Queen bed, Upstairs loft has 1 queen bed and one double bed plus 1 single beds. All linens, towels supplied. Huge deck facing lake with outdoor Hot Tub! Chalet located on a private dead end road-Quiet, no traffic. Park is approximately 300 feet away with a heated outdoor association swimming pool which is private, not public! Natural Wood Burning Stove with central heating system also. Non smoking chalet, please. Thank you! linens, towels, utensils,.This chalet is completely furnished; a home away from home! DVD Player plus movies in living room area. Extra large dog kennel is in garage for your pet so you don't have to haul one with you! 2 Kayaks and Paddle Boat for your use located on your beach. Bring your wave runners and small motor boats-perfect for pontoons. Pontoon and golf cart rental are available. Please ask! Fishing can be done right off dock and you can see the fish you are aiming for! Lake has bass, perch, bluegill, sunfish, & pike and you can see them swimming by on a calm morning or evening as lake is crystal clear. Over 25 golf courses, most within 30 minutes of Chalet. Snowmobile DNR trails accessable within 10 min from home. Also Ski Hills nearby. Plenty of trailer parking at chalet. Lots of board games and books for adults and kids. Satellite Dish available in living room and master bedroom. Private 60' sandy beach w/dock, 2 kayaks and paddleboat to use while you stay with a long dock to fish off! All beds and bathrooms are set up with fresh linens prior to your arrival. Wood burning stove-bring wood. There may be some wood there but if not, they sell wood at gas stations/convenience stores plus some homes sell it at the roadside. Kitchen is set up as Home away from Home! Pots, pans,dishes,utensils, silverware, even sugar,coffee, cream, Kitchen is stocked well with most popular kitchen staples. Outdoor heated pool located at the main park/pavilion/beach area roughly 500 yards away-walk to pool! Enjoy all Lake Arrowhead has to offer. Park is walking distance from back door which has outdoor heated swimming pool, covered pavilion, grills beach, volleyball & basketball and playground. Stove, Refrigerator, microwave, coffee maker, washer, dryer, dishwasher, all linens, towels, utensils, propane grill. This chalet is completely furnished; a home away from home! DVD Player plus movies and stereo in living area. 2 Kayaks and Paddle Boat for your use located on your beach. Also a kids log cabin to play in, sand toys to make castles:-) Bring your wave runners and small motor boats-perfect for pontoons. You can also rent a pontoon and golf cart while you stay at Sunset Beach-please inquire-book up quick! We had a blast ❤!!! This vacation home fit it's description! We had a wonderful view of the lake and hot tub! Everything was very clean and well supplied! The owner was very welcoming and helpful with incoming directions. Great home to create family memories! We stayed in this cabin for a long weekend getaway and it was very relaxing. Everything was clean. We had a nice welcome note on the counter when we got there. I would recommend staying at this owners rentals. We enjoyed the outdoor hot tub even in the snow. Beautiful setting - great area! Enjoyed the home - appreciated all of the area information that was provided. House was equipped with everything we needed. Had a lot of fun and would return in a heartbeat. Whole process was an easy one. Thank you! Nice property on the lake! We traveled to the area for a funeral, but wanted the kids to have something to do. This was a great cottage on the water. The kids loved the row boat, kayaks and fishing off the dock. The garage/rec room was fun too! The cool nights were spent in the hot tub! Great place, will be back! Great location, clean and plenty of room. Game room and hot tub were great to have! Very impressed with the property, would stay here again. Really comfortable space. Very clean inside and out. Terrific owner to work with. With 17 golf courses having championship golf designs by some of America's top golf course designers, the Gaylord area is your dream golf destination. The Pigeon River State Forest’s expansive 105,000 acres with the Midwest’s only free ranging elk herd offers a unique wilderness experience that is just a short drive from downtown Gaylord. The Department of Natural Resources maintains this excellent elk habitat through careful forest and wildlife management. Experience all that is Northern Michigan along one of the many trails in Otsego County used for hiking, biking, x-country skiing and snowshoeing. The area abounds with pathways for outdoor enthusiasts of every skill and age level, and all are free to use with no trail passes required. In Gaylord you'll find the gently sloping terrain, heavily wooded forests and deep annual snowfall ideal for Nordic skiing. It is also not uncommon to see plentiful wildlife out on the trail. Trails are from rustic and scenic at the Pigeon River State Forest, to elegant and expertly groomed.